At first, in my 5Rhythms Sweats, I never paid much attention to the altar. In fact, my relationship with altars and installations has been a complex one. The word “altar” was often associated with Christianity in my mind – and I don’t like Christianity. I dislike the institution of religion and the dogmatic forms religion can take. For my first altar, I created a black cloth with white feet painted on it (my own feet), a circle with branches over the cloth and some musical instruments. My intention was to create something that could represent all the dances (feet) held by the circle (the venue) and with the help of rhythm (instruments). Since then, I’ve been using the same cloth, sometimes removing the branch and instruments and adding candles. 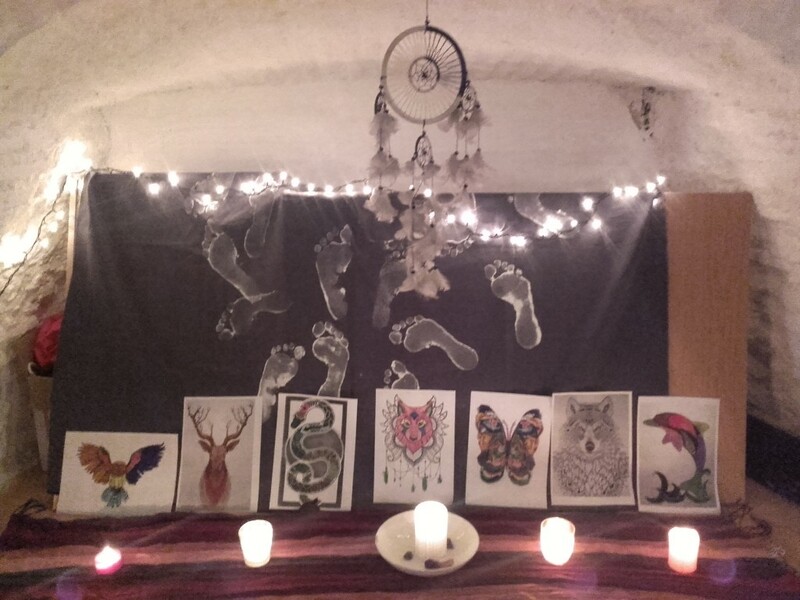 My journey with 5Rhythms Sweats has been quite difficult: I have faced challenges with changing venues, struggling to find a good venue, poor attendance (sometimes only 2 people), exhaustion … and I didn’t want to create an altar. Yet always, at the end of a 5Rhythms Sweat, I thought: “This could have been better”. And one day, I just surrendered to the offering implicit in the act of creating an altar. It was like the missing piece – I had my laptop and my music, but something was missing. It wasn’t about the physical altar itself. It was the intention, the focus, the clarity. The creation of something sacred. The inspiration that an installation could bring to the dance. That was a key moment for me. I realised I could forget about the word “altar” and use “installation” – they are just words. 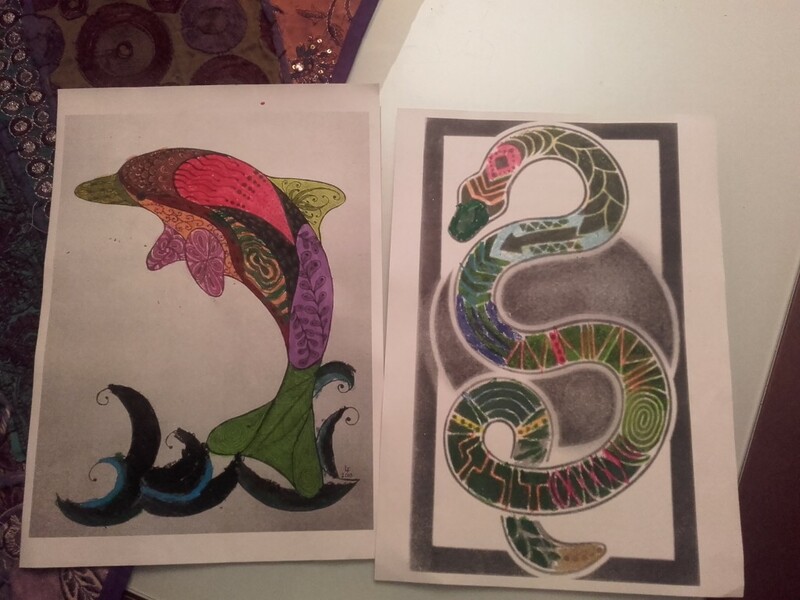 So I took these images of the power animals, printed and coloured them with my kid. It was so simple, like a game – just painting them. But it was more than that: it was deeply healing, opening me up to the force of calling, creating space, to the mystery of what’s going on in the next 5Rhythms Sweat. And most importantly, I had that feeling of “getting out of the way” rather than trying to hold every aspect-of-everything in a tense way as I had been doing. After this work, including using the altar in the 5Rhythms Sweat, holding space became easy. I could just go out there with the dancers, the rhythms, the space. I now had a support not only for them but for me. I think I really needed this healing work with altars and installations. So now, when I come to create an altar, I like to think in terms of art or installations: words free from religious meaning. An altar is something that can evoke the inspiration to go deep in the dance, to bring that kind of energy to the room. It can offer a “key” that transforms the dance into something with profound personal meaning. And I love installations that are all around the venue: the space itself becomes an installation. 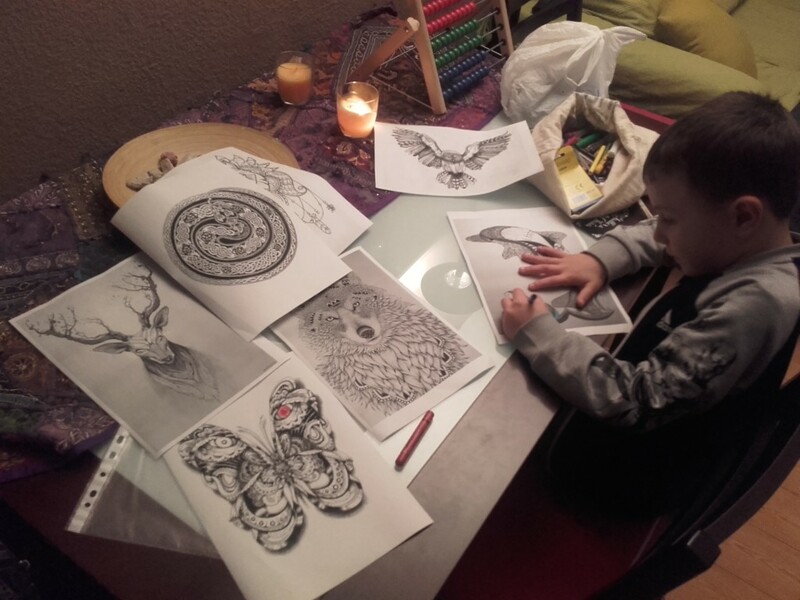 Here, I’m working with my 6-year-old son, coloring some totem animals I wanted to bring to the dance: wolf, fox, dolphin, deer, owl, snake and butterfly. My son chose a dolphin to colour first; I did a fox (shapeshifter, of course!). Then my son selected a snake: yes! Very proud!